Wandering towards the Port Albert jetty, I hear the sounds of children squealing, water splashing and a dog barking its encouragement. 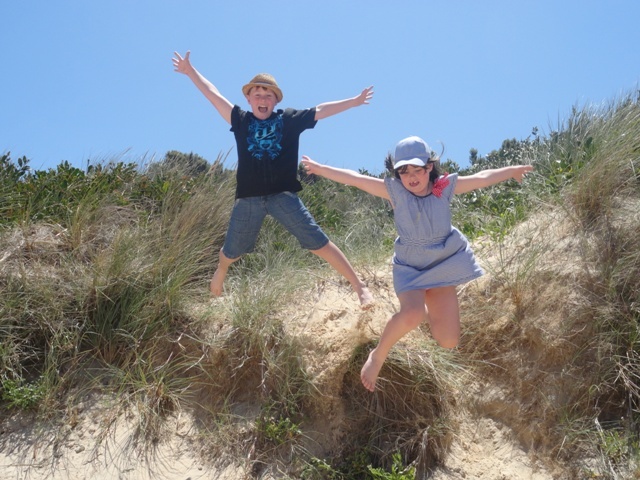 Such a quintessential Aussie scene, it makes me smile – until I realise it is my 7-year-old “baby” about to jump. People around me laugh. I know why as my husband tells me it’s too late – she’s done it 3 times already. Re-assured by a local mum with a 4-year-old jumping veteran, I take a deep breath and watch my ‘babies’ having the time of their lives, urged on by Red Dog (as they named him) a blue heeler who joined in on their fun. Don’t be scared mum – we’re not. This was one of the many wonderful experiences of our 5-day adventure into this “undiscovered” corner of Victoria’s scenic Gippsland region. It was my husband, a keen recreational fisherman, who wanted us to go to Port Albert. Indeed, it is the town’s boat ramp that is the busiest place in town. Today it remains a quaint, historic fishing village full of charm. To me it is more ‘Pearl Bay’ than Barwon Heads, which has experienced a burst of modern development since the much-loved TV series was on our screens. This sort of development is yet to reach Port Albert (and dare I say, maybe I hope it never does). Our home for 5 days was Blithe Spirit, a comfortable homestay run by local couple Carol and Wynne Hobson. This local couple were involved with the town’s once thriving gummy shark fishery, before turning their hand to tourism. 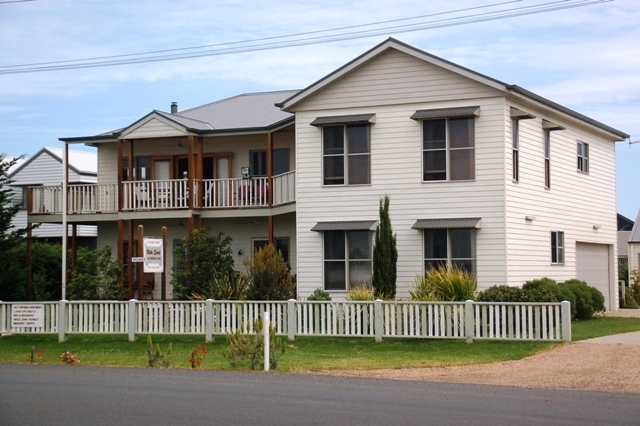 Blithe Spirit – homestay accommodation. As well as running Blithe Spirit, they also run a charter business, taking visitors on their yacht, Nooramunga, to explore the waterways of Port Albert and beyond. Settled in 1841 as Gippsland’s first port, Port Albert was the entry point for migrants seeking their fortunes in the goldfields. Its waters also claimed many ships, the most famous of which, the PS Clonmel in 1841, was integral to the town’s development. Today, a lot of that history remains through its old buildings, including the old Bank of Gippsland (1862), which houses the Gippsland Regional Maritime Museum. I was pleasantly surprised at the quality of the artefacts and information, including a display of the Omega global positioning navigation system equipment that was located at nearby Woodside. The Omega system was the fore-runner to GPS and provided navigation systems for aircrafts and ships, with eight towers positioned at various points on the globe. 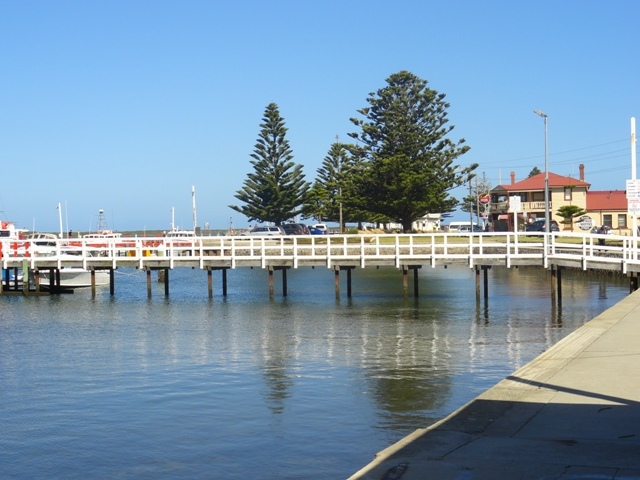 Port Albert is a hidden gem amongst Victoria’s many coastal towns. But Port Albert is not just about history. It is also about nature. The town is located within the Nooramunga Marine and Coastal Park. As well as the Old Port Walk Trail, there are numerous bike paths in the wider area, many of them part of the rail trail network. While coastal park means more mangroves than sand, children will find a way (hence the wharf jumping). There is a small stretch of sand children can paddle in at low tide and Ninety Mile Beach is less than half an hour’s drive away. Another option is the outdoor heated pool at Toora. This delightful country swimming pool ended up being a highlight of our trip for the kids, with its poolside basketball and tractor tyre tube. Not to mention the fact we had the pool to ourselves! 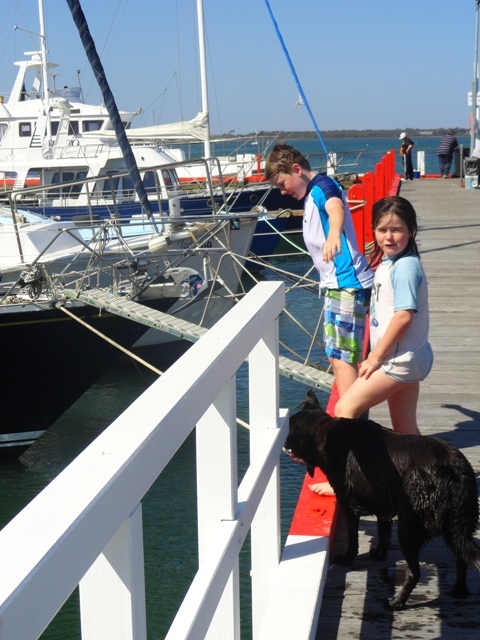 However, it is for those with their own boat that Port Albert comes into its own. With some 100km of sheltered waterways, spits and islands, the boating is magnificent and picturesque. Although a slight motor issue put a halt to our marine expeditions, we did manage to spend a lovely day on the water, motoring out to Clonmel Spit. This is a beautiful stretch of sand, but with a tide going out, we were loathe to get too close to shore in the shallow waters. Instead, hubby and the kids jumped off the side into waist deep water and snorkelled and dug for yabby bait. In addition to our motor problem, the windy weather was not on our side either. But that lead us to explore the local area, including Tarra Bulga National Park. As we found ourselves on a winding, narrow gravel road, I wondered if we were on the right track. I was sure we had followed the signs. I am not a good forest driver at the best of times, and with no other cars in sight, I was just about to blurt out to my hubby “I want to go back” when we arrived in the small forest town of Balook. We had made it (I later found out we had ended up on a back road). But the journey was worthwhile. Tarra Bulga National Park is stunning. With its tall mountain ash and lush fern gullies, this area is unique and spectacular. A visitor centre can fill you in on the area’s natural and historical heritage. This tree is so big! During our walk to Corrigans suspension bridge, we listened to the sounds of the forest. Unfortunately, this was interrupted by my husband, who is currently obsessed with the TV show, Finding Bigfoot. “This is definitely “Squatch territory,” he said, letting out a Bobo ‘squatch call’ much to the fright and delight of the kids. I just hoped no-one was coming around the next bend to discover this crazy family. 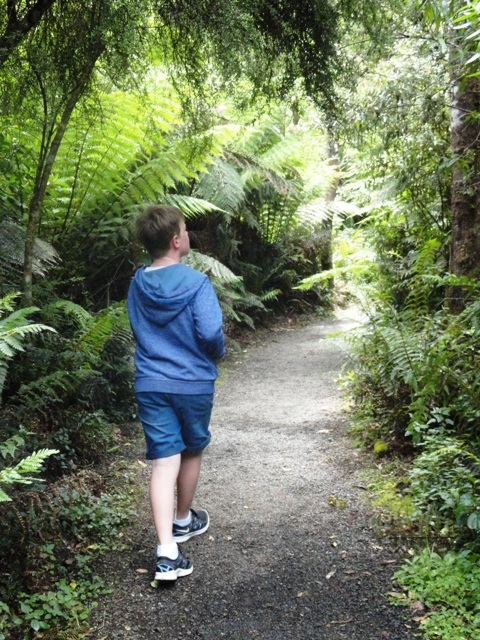 After a lovely lunch in the country charm of the Lyrebird Cafe, we made our way back to Port Albert, following the Tarra River through it picturesque valley, stopping for another walk to the Cyathea Falls walk. On the subject of food, Port Albert might be small, but you can get a great coffee thanks to the Port Albert cafe & wine bar. We ate at Wildfish, which, consistent with a small town, is run by the son of our accommodation hosts. With its chic, fine dining look, I was a bit worried taking the children, but was proven wrong as soon as I walked in and saw high chairs. There was a children’s menu too. Located on the wharf, the location is superb, as was my crispy citrus prawns on coriander & wasabi soba noodles. But if you are not up to dining out, get take-away fish and chips from next door. Our flake was like I remember it as a child – thick and well, flakey. To us at least, it did measure up to its reputation of having Victoria’s best fish and chips. Getting there: Port Albert is about a three hour drive from Melbourne, along the South Gippsland Highway. 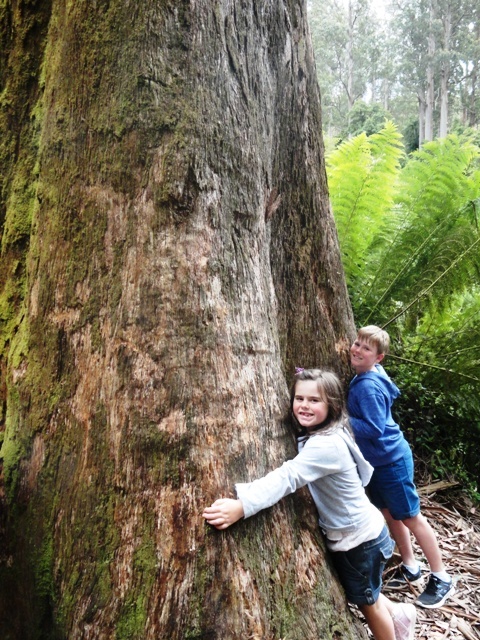 While there: A visit to Tarra Bulga National Park is a must. If you have not got your own boat, take a cruise with Nooramunga Sailing Tours. 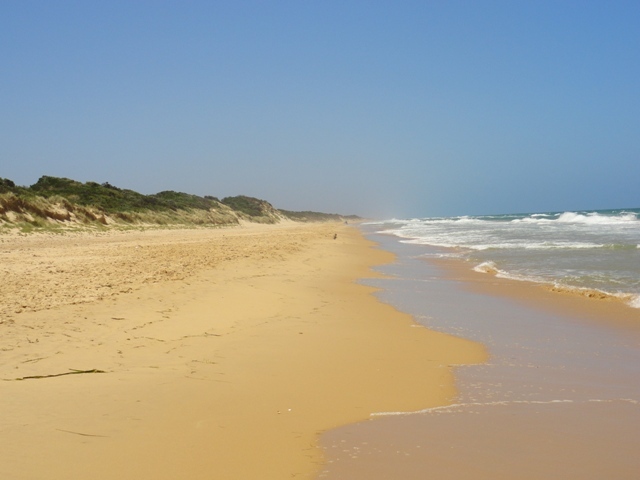 Explore the western end of Ninety Mile Beach. Take a day trip to Wilsons Promontory.